Joshua Loving grew up in Honomu on the Big Island of Hawaii. 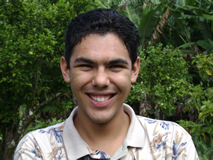 He is currently a freshman at the University of Hawai’i at Hilo pursuing majors in mathematics and computer science. As the eldest of ten homeschooled children, he has found his math tutoring position a natural fit. Through the CfAO internship he desires to build a relationship with the astronomical community on his home island so he can continue to work with them in the future. After graduating from the University of Hawai’i at Hilo, Joshua plans to go on to graduate studies in computer science. Astronomical observatories generate large amounts of data in their exploration of the Universe. Fiber optics form the backbone of data transfer both within the telescopes themselves and from the telescopes to elsewhere. The goal of my project at Subaru Telescope was to fabricate, test, and repair fiber optic cables. An important fiber optic testing tool is the optical time domain reflectometer (OTDR). An OTDR detects the amount of backscattered light in a run of cable and generates a graph, known as a trace, of the attenuation levels along its length. By analyzing events, or drastic changes, in the trace of a fiber, the location of breaks or junctures can be found. Before the OTDR could be used for testing, fiber optic jumper cables had to be fabricated to attach the OTDR to the cables under test. Traces of cables with known characteristics were taken with the OTDR, which allowed events on the trace to be correlated with connectors and splices in the fiber. The practical application of this work was the installation of an audio monitoring system on the Infrared Camera and Spectrograph (IRCS), a near infrared instrument at Subaru Telescope currently mounted at the Nasmyth focus. Microphones were placed on IRCS and connected to audio equipment in the control room by fiber optic cables that were tested using the OTDR. In order to monitor IRCS for any problems, operators will now be able to listen to various components of the instrument as it is being used.